Because Google doesn’t include exFAT support on their flagship Pixel phones, importing photos is a pain. For now. This post has been updated: see the update at the bottom of this post. After many years, I changed my smartphone over from an aging iPhone 6S to the newly announced Google Pixel 3 XL. So far, I have to say that my experience has been wonderful but there have been a few idiosyncrasies with the Pixel 3 that I don’t know if they’re just because I’m thinking about them in an iOS manner or if they’re actual issues. One of those issues is importing photos from an external camera memory card. A major caveat is that I am not a professional photographer. Photography is a hobby of mine and I try to get better at it for my own use and sanity. I’ve developed a workflow that’s centered around Adobe’s Lightroom Classic CC with bits that work in the cloud. Despite being a tech person, I’m not fully a cloud devotee–yet. On the iPhone and, by extension, the iPad, the photo ingestion process from a camera memory card was simple: Insert an SD card into the Lightning Camera Connection Kit, launch Photos, hit Import All, and Bob’s your uncle. It was that old Apple ethos of it just worked. Maybe I need to back up here for a moment: There are actually four variations of Secure Digital, or SD, cards: SD, SDHC (SD High Capacity), SDXC (SD eXtended Capacity), and SDUC (SD Ultra Capacity). The dividing line between each variation is based on total size of the disk, which you can read here from the SD Association, the standards-bearer of SD cards. What’s germane to this essay is that SDXC and SDUC cards both default to the exFAT file system, which was developed by Microsoft and is proprietary to them. 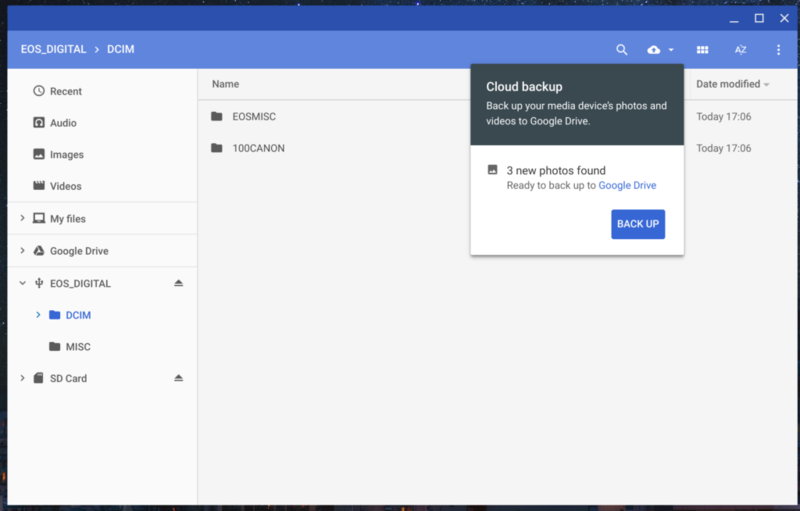 The obvious workaround is to format the disk to a file system that works on the Pixel 3. But the problem is this: If you reformat that disk on, say, the camera, then it is formatted by default to exFAT. Oops. Formatting the disk deletes the contents of that disk and then you wouldn’t be importing any photos. OK, so what are some other alternatives? Well, there’s the Canon Camera Connect app. Setup is easy with the Pixel 3’s implementation of NFC (woo! ), but there’s this problem: The app only transfers JPEG files over from the camera, not RAW files. If you’re shooting RAW+JPEG, then the JPEG file from each pair will transfer. If you only shoot in RAW, then a 400-500 KB JPEG file is developed and that’s what is transferred. It works in a pinch but it’s a hardly ideal solution for importing photos. Now it’s back to the drawing board. I had so hoped that I could make my new Pixel the center of my digital life and use it as a sort-of notebook computer on the road but that seems to be a bit challenging. If only Google would license exFAT to be able to be used on their flagship product! UPDATE, 17 January 2019: A follow-up post on this has been made that outlines a fix using an app available on the Google Play app store.